"It is difficult for historians to declare a certain date for the foundation of Wayrest. A settlement of some variety had been in existence where the Bjoulsae River feeds the Iliac Bay possibly since the 800th year of the First Era." 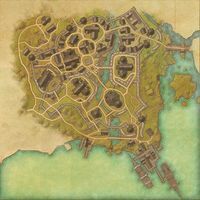 — Sathryr Longleat, "Wayrest, Jewel of the Bay"
Wayrest is the capital city of the Daggerfall Covenant, located in southern Stormhaven. It is a prosperous trading city situated on the northern coast of Iliac Bay. The city is split into seven districts. In the northern part of the city, running from the north gate to the east gate, lies the Residential District where many of the homes are situated. The city stables and an inn can be found by the north gate. West of the river and south of the Residential District lie the Merchant District and Market Square, which contain many of the city's traders and merchants, as well as the Fighters Guild. 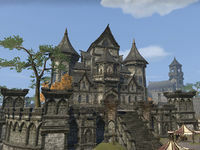 In the west, the Temple of the Divines and Wayrest Castle dominate the Temple and Palace Districts respectively, while in the east, the Wayrest Treasury building marks the Banking District. 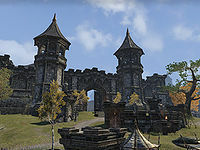 The west gate, leading towards Farangel's Landing and the At-Tura Estate, can be found in the Palace District, just past Wayrest Wayshrine. Just inside the south gate, the Mages District houses the Mages Guild and the Chironasium. 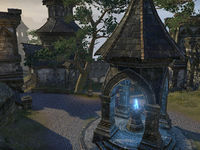 Outside the south gate, on the banks of Iliac Bay, sit Wayrest Docks, from which it is possible to buy passage to Alik'r. Outside the city walls to the north lies the shanty town of Dreughside. This district has recently been besieged by the dreugh from which it gets its name. Wayrest Wayshrine ( Leveled(?) XP) is located in the Palace District, behind the castle, at the top of the hill which leads up from the Mages District Chironasium.